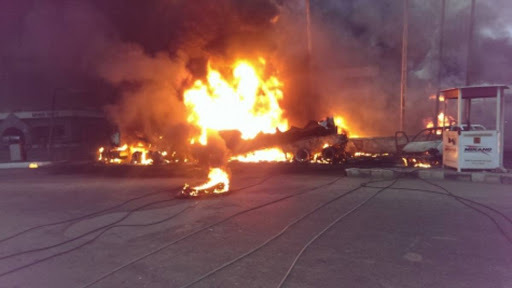 Magistrate Banji Ayeomoni of Okitipupa Magistrates’ Court in Ondo State, together with his son Dara, another relation and his driver were reported dead in an inferno caused by a petrol tanker spillage in Ekpoma. An official of the court, who spoke on condition of anonymity told the News Agency of Nigeria, on Saturday, that the incident happened on Friday night close to Ambrose Ali University, Ekpoma. The official said that the late Ayeomoni went to visit his children at Ekpoma, adding that while returning his vehicle ran into the petrol spillage caused by a tanker which caused fire and other vehicles behind were also affected. The source added that the Magistrate’s son, Dara, who is a 500 level student of medicine of AAU, a young boy, who is the son of the deceased’s sister-in-law and the driver died at an undisclosed hospital shortly after the accident. “It was indeed very sad news to all members of staff and lawyers in our court,’’ the source said. Meanwhile, Insp. Zedekiah Orogbemi, the court’s prosecutor who also confirmed the incident to NAN said that he was shocked when he got the news. NAN reports that the 59 year-old Magistrate, who was due for retirement next year, left behind his wife and two other children.